Lasseter at the Austin Film Festival on October 22, 2011. Photograph taken by Vanessa Lua. John Alan Lasseter (born January 12, 1957) is an American animator, movie director and the chief creative officer at Pixar and Walt Disney Animation Studios. He is also currently the Principal Creative Advisor for Walt Disney Imagineering. Lasseter bought Pixar from the late Steve Jobs. 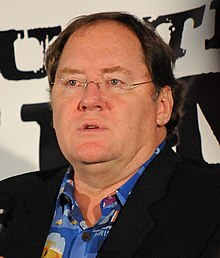 Lasseter has been married to Nancy Lasseter since 1979. He was born in Hollywood, California. ↑ Grover, Ronald (March 10, 2006). "The Happiest Place on Earth -- Again". Bloomberg Businessweek. Retrieved April 20, 2012. ↑ Kit, Borys (14 October 2010). "Disney Picks Pixar Brains for Muppets Movie". The Hollywood Reporter. Retrieved 24 November 2011. Wikimedia Commons has media related to John Lasseter. This page was last changed on 5 May 2018, at 02:23.